Calming a child's temper tantrum can be a daunting task. With persistance, you can learn what you can do to make it through the rocky patches of your child's life, and how to calm even the worst temper tantrum. 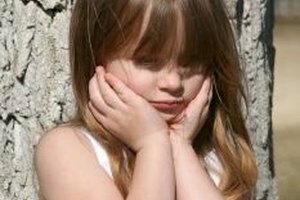 Try to avoid a situation that can cause a child's temper tantrum. For instance, try to avoid scheduling trips when your child is tired or hungry. Make sure they are well rested and fed before embarking on any kind of errand. Try to distract the child in the middle of a temper tantrum. Sing a song, offer a snack, or point something interesting out. Some children can be calmed during a temper tantrum by simply being picked up and held. Ignoring a temper tantrum works in many cases. Children want attention, even negative attention, and not getting a reaction out of anybody will usually cause them to stop. Relocate. If your child is throwing a temper tantrum in a store, try and take them out of the situation. Even if it is just for a minute, many children calm down when they see that you may just leave. Acknowledge that your child has feelings. If they are throwing a temper tantrum over a toy, acknowledge that you understand how they are feeling. This will give your child a chance to verbalize his feelings. You could write down what he wants and show your child that maybe later he will get it for a special occasion. If the tantrum seems to be one out of jealousy, such as a big brother being jealous of his baby sister, try giving that child extra attention. Make him realize that his parents are there for him, and he is just as special and loved. Do not give in to a temper tantrum and buy a child what they are screaming for. How Does an Overbearing Mother Affect a Child?